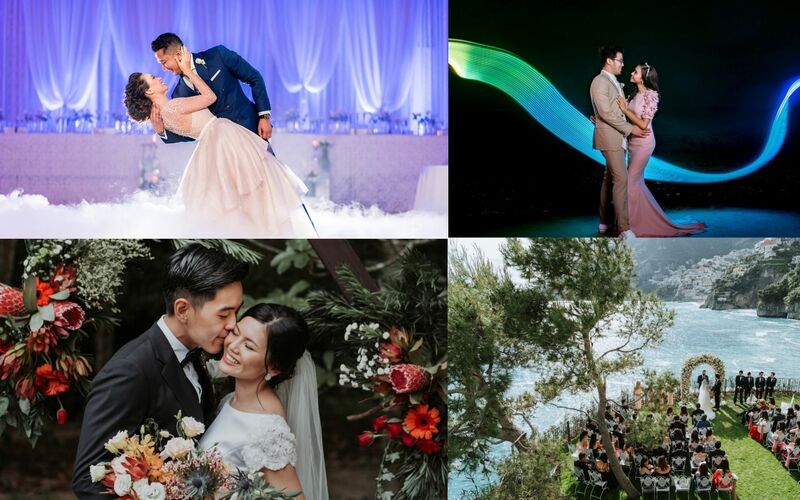 MunKeat Photography and The V are the expert talents when it comes to preserving outstanding moments from high-profile and destination weddings like a scenic exchange of vows by the ocean. Here we ask them what it takes to capture the perfect shot. 1/6 How long have you been photographing weddings? The V: My partner (Sadiq Syibli) and I (Ramzul Alam) started doing wedding photography and videography professionally as a company for the past 6 years. On top of that we are actively doing corporate and productions and have been listed and registered as vendor for few international companies operating in Malaysia. MunKeat Photography: I shot my first wedding back in 2008. It started off as a favour for some friends and later turned into a passion. I was a regional manager back then and started doing wedding photography on freelance basis for around 3 years before turning full time. Munkeat Photography was formed in 2010 and is officially 9 years now with a team of 11 highly talented team mates which I am really proud of. 2/6 What does wedding photography mean to you? TV: When we get a wedding invitation card, we expect nothing less than a celebration of two persons becoming one. We have been working with more than hundreds of weddings across the years and we can gladly say wedding photography is such a beautiful job, where we help the bride and groom to document their special day the best as we can. MP: Preserving precious memories for our clients. 3/6 What should couples know before hiring a wedding photographer? TV: Know your style, set an appointment and check out their portfolios (not just social media). Check their website for samples of full event coverage and get to know the person in charge and their work flow. Understand their terms and conditions and finally, get to know their rate and your budget. Couples need to also make sure the photographer/company is good in giving direction for the poses and are responsible to cover the event such as capturing candid moments. MP: Here're some tips to look out for; know your preference because like wedding gowns, photographers come in various style and mood. It's best to meet the photographer personally before signing up in order to make a good connection. All in all, it's all about communication. If you are based overseas, you can always set up a call on Skype or Facetime with the photographer. 4/6 What should couples discuss with the photographer before the ceremony? TV: We basically will get as much info as we can to understand our clients' needs to smoothen the event. Any special request by the family need to be raise up so we know how many shooters need to be assigned for the event. For instance when the bride or groom’s parent require a photographer to follow them anywhere they go to greet their guests, we need to assign an extra shooter specifically for that task. MP: I can never stress how important the contract is. It should cover all the details from the package deliverables to absenteeism in case the photographer is sick, these terms should all be listed in black and white for the ease of both parties. Having done my own wedding, it is also important to have a budget for everything. 5/6 What is the one rule you follow when photographing a wedding? TV: We always put beauty as the main key element for our shots. Other than that, our main rule is to always keep shooting because we will try our best not to miss any faces or moment happening in that event. MP: Every client has their own preference and expectations. I believe that understanding your client is the main rule for me when shooting a wedding and nothing more important than that. We as a photographer have to see the wedding in their perspective and your point of view will be their memories for a lifetime. TV: I really hope dark-warm tone will fade in the wedding scene. Yes, it looks beautiful now with the current trend on social media but believe me, wedding photos must be clean and simple to be remembered. We want to see the event's true colors, the real atmosphere and the true ambiance of the event's mood. MP: Trends come and go and it’s very subjective just like music. I have no comments on that…best to keep it timeless if you ask me. Looking to capture the wonderful moments on your special day? Visit www.thev.co and www.munkeatphotography.com for more information.